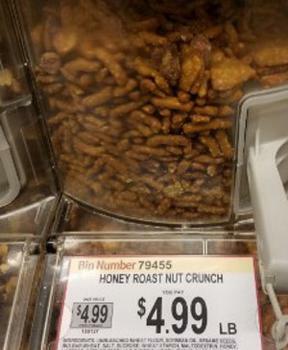 First Source of Tonawanda, N.Y., is recalling Honey Roast Nut Crunch containing almonds, an allergen not declared on the label. The recalled item was sold by the pound in the bulk foods department of 30 Wegmans Food Markets in Massachusetts, Maryland, New Jersey, New York, Pennsylvania and Virginia from October 9 – 19, 2017. Wegmans is placing automated phone calls to customers who purchased the product using their Shoppers Club card.